Ekambareswara Temple is located in the northern part of Kancheepuram town, the land of temples, and is the largest temple in the town. Ekambareswara Temple is dedicated to Lord Shiva and is one of the five major Shiva temples or Pancha Bhoota Sthalams representing the five major elements which are Earth (Kanchipuram), Air (Kalahasti), Water (Tiruvanaikka), Fire (Tiruvannamalai) and Space (Chidambaram). Ekambareswara Temple represents the element Earth. Ekambareswara Temple was built by the Pallavas in around 600 AD. The temple was later modified and re built by the Cholas kings. Adi Shankar Charya with the help of local rulers expanded this temple. Later on the Vijayanagar kings went on to make a lot of contributions to this temple. A word of caution though that there exists another Ekambareswara Temple similar to this temple in Chennai as well. 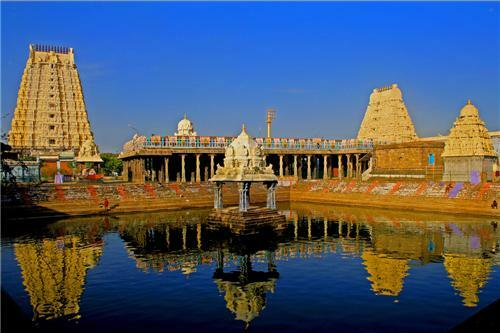 The Ekambareswara Temple in Chennai was constructed by a Vijayanagar ruler to save the travelling time to Kancheepuram. There are many legends behind the temple which revolves around Lord Shiva and Goddess Parvati. One such legend says that once Lord Shiva was busy in the task of creating and destroying the universe. Goddess Parvati in jovial mood created obstruction by closing Shiva’s eyes. Lord Shiva got angry on Lady Parvati and cursed her to do penance for her deeds on earth. Goddess Parvati started her penance under the mango tree in Kacnheepuram. In order to test her devotion, Lord Shiva sent fire on her. Goddess Parvati with the help of Vishnu averted it and continued her penance, again Lord Shiva sent Ganga to break her penance but Goddess Parvati averted it too. Goddess Parvati went on to make a Shiva Linga out of sand to get united with Shiva. As Parvati regained Lord Shiva under the mango tree, he came to be known as Ekambareswara or the “Lord of mango tree” and hence a temple was built on his name at that place near mango tree. Another such legend says that once a washer man who lived in Kancheepuram used to wash the clothes of all the Saivites and was an ardent devotee of Lord Shiva, Lord Shiva in order to test his devotion came in the form of an old Brahmin and asked him to wash hi clothes before dawn. At the same time Lord Shiva made the weather cloudy. On seeing the weather the washer man was very disappointed and collided his head with the stone. On seeing this Lord Shiva appeared in his true form and graced his devotee. Another legend says that once Vegavati River overflowed and threatened to engulf the Shiva Lingam that Goddess Paravti made out of sand under the mango tree. Parvati or Kamakshi, embraced the Lingam, and Shiva, touched by the gesture came to his true form and married her. Ekambareswara Temple sprawls over 23 acres of land. The temple’s Gopuram (a monumental tower at the entrance of the temple) is about 59 m which is the tallest such structure in south India. One of the exquisite features in Ekambareswara Temple is the Aayiram Kaal Mandapam, or the "hallway with a thousand pillars", which was built by the Vijayanagar Kings. Other features being the presence of 1008 Shiva lingams decorated in the temple’s inner walls. There are a total of five courtyards apart from the thousand pillared hall in the temple. There is a small Ganesha temple and a pond in the fourth courtyard and lots of smaller shrines in the third courtyard. The Shiva Lingam along with the image of Shiva is there in the deep interior of the house or the sanctum sanctorum. There also is a small shrine for Lord Vishnu inside the temple complex. Vishnu is prayed as Vamana Murthy in this temple and it is one of the 108 Divya Desams or Vishnu temples. There is a mango tree in the temple which is almost 3,500 years old. The tree has four branches and is said to yield fruits of different tastes, sweet, citric, spicy and bitter, depicting the four Vedas. Deity of Lord Ekambareswara or Lord Shiva is in a separate shrine of glass under the Rudraksha Pandal-tent, the roof with 5008 Rudrakshas. The deity of Lord Shiva is in huge form inside the temple. It is said that, the deity darshan (view) grants the devotee total relief from the cycle of births and deaths. Panguni Uthiram festival is celebrated in the month of March or April and is the biggest festival celebrated in this temple lasting for 13 days. During this festival wedding of Lord Shiva and Goddess Parvati is performed. Devotees also throng this temple during new moon, full moon and pradosha days. Other festivals celebrated in this temple are Ani Tirumanjanam (June-July), Adi Kritikai (July-Aug), Avani Moolam (Aug - Sep), Navaratri (Sep-October), Kartikai Deepam (Nov-Dec), Thai Poosam (Jan-Feb), Panguni Uthiram (Mar-Apr), Chitra Pournami (Apr-May) and Vaikashi Vishakam (May-June). Ekambareswara Temple opens from 6.00 a.m. to 12.30 p.m. and 4.00 p.m. to 8.30 pm on all days of the week.